This is my new tidbit page. It is here where I will be throwing up random facts about the show that I have uncovered in my research which absolutely have no other place on my website! - In the newer shows, the couch made out of a car primarily on the Ask the Experts segments was made out of a 57 Pontiac from Mr.Used in Hamilton, Ontario. According to the 5th Red Green chat from Redgreen.com, the back end was used on Seinfield in Kramer's apartment. (Can be seen in Season 7's "The Cadillac" episode for example). - Also,according to the 5th Red Green chat from Redgreen.com, Red mentioned that Harold's Axe is made up of the "control panel from an AMpex 1200 plus the keyboard from a Commodore 64 and a pair of rabbit ears." Incidentally the rabbit ears are from a 12" RCA color television and the strap is reported to be from Steve Smith's old guitar. The headset is from one of the station cameras which plugged into the axe. It's also been reported that the axe itself was functional in that the lights would flash up and the two meters would move. - When asked if there was a lot of improvisation between Harold and himself on set, he said " Pretty much none. That's probably a big surprise. The lines were tightly written, The way we said them was not." - Red's favorite segment "The Handyman Corners were fun for me because of the creativity but the live studio audience made the best moments. The Word Games were a hoot but for me personally probably sitting at the desk talking about being a man was my favourite." - Possum Lodge is located 168 Beer stores North of Toronto. It was mentioned at the 4th Red Green chat (Jan 2010) that Red always wanted Bob Newhart and George Carlin to appear on the show, but it never happened. - Red green was the first media in space. A US crew took a copy of “The Best Of Red Green” with them to the MIR Space Station in the mid 1990's on a mission before MIR was decommissioned in favour of the International Space Station. It was never recovered and is presumed to be still inside MIR at the bottom of the Pacific Ocean to this day. - During the Adventures with Bill segment, it is a staple to have Red do the voice overs of the days adventure. When asked if he enjoyed doing this he replied "I always enjoyed. It was the only unscripted part of the show. We'd just run the films and I'd talk along. Right in front of the live audience." - Director William G. Elliot is famous for more than just his long time stint on RGS. His son Brian is the starting goaltender for the NHL's St. Louis Blues (and formerly with the Ottawa Senators and Colorado Avalanche). Brian has mentioned that he was a huge fan of the show publicly and often enjoys watching the show during downtime on the road between venues. - A season 3 episode entitled The Possum Lake Regatta is the inspiration for groups of fans in Fairbanks Alaska. Every year they hold their own Regatta in tribute to the show as shown here. - An early NHL hockey player - Red Green (Christopher Redvers Green) played for and had his professional start with the Hamilton Tigers shortly after the NHL was formed in the early 1910's. What is ironic is that the Red Green Show had its start in Hamilton as well almost 75 years later. – During an interview on the Drew Marshall Show (December 5, 2015), Patrick McKenna mentioned that in the first season, they predominately would be sitting to do many of the scenes because the microphones were hardwired into the chairs. - Patrick McKenna also mentioned that Red Green was let go from “every network in the country”. - It was revealed by Patrick McKenna on the Drew Marshall Show (December 5, 2015) that the legendary CBC show Royal Canadian Air Farce told CBC execs that they wanted RGS to be their lead in on Friday nights. - RGS is the longest running Canadian comedy show at 15 years/300 episodes. (The Beachcombers is considered a drama and because of this, is not really thought of being in the "comedy" realm with its 17 seasons and 387 episodes). 3. 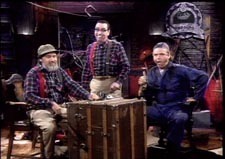 The Red Green Show - 1990-2005 - 15 seasons/300 episodes (Note: Until Red Green ended in 2005, it had more seasons under its belt than the Simpsons. Until season 12, it had more episodes as well. When asked during the 4th chat on Redgreen.com, about if any of the characters on the show were based on people he knew, Red replied that "Most of the characters were based on the guys who played the part. Peter Wildman who played Buzz Sherwood is a crazy whacko who chews coffee beans. Peter Keleghan who played Ranger Gord is the most dutiful loyal person you'll ever meet. Jeff Lumby who played Winston Rothschild is an enthusiastic entrepreneur. And on and on." Everyone loves the Possum Lodge Word game, but very few know really anything about it. According to Red, the writing was always a combination of work from several people. "I'd tell the writers what I needed for a season - like say 18 Word Games and 6 Experts, for example. Then I'd ask them for ideas. I'd also generate ideas myself. If I saw ideas I liked I would assign the guy to write a script on that idea. Then we'd all rewrite it and I'd have the final say. We would even sometimes change the script just before we performed it." Another little known fact is the Red Green with Strings Attached program that Steve Smith ran with his Wife Morag back in 2010. They visited with several orchestras and performed shows with content from their former TV show Smith and Smith as well as a segment with Steve as Red. According to the Windsor Symphony Orchestra "Canada’s oddest Handyman performs with the symphony. Self-penned campfire songs like “The Marshy Bog Jig” and “Don’t Lick a Toad” finally get the musical backing they deserve. Hear Red tell a fantastic story about Lodge life while every amazing plot twist is enhanced by full orchestral accompaniment a la Peter and the Wolf. Red shares his views on life, love and the pursuit of handiness while building an elaborate device out of doorbells, car horns and a whoopee cushion and then uses it as his featured solo instrument while playing with the orchestra." Red event built his own instrument onstage to play with the orchestra that was made up of a 16-foot articulating ladder, a 20-pound propane tank, and a six-pack of empty beer bottles, a bicycle, a shipping trunk, and a hockey stick. From what i can find, the shows were performed in Windsor Ontario with the Windsor Symphony Orchestra and Halifax with the Nova Scotia Symphony Orchestra in Halifax. For more information, including a picture of the show's advertising, you can find it on the Windsor Symphony Orchestra's website here.